This game has blown me away. Whatever Rocksteady does next, I’m already interested. I know I’m only a month or so removed from the game’s release, but that seems like a lifetime these days, when my entire friends list has already deserted this for Forza 3 and FIFA 10. We’re a fickle bunch with short attention spans, us gamers. But anyway, my initial statement is an accurate summation of how this game makes me feel, now that I’ve got around to playing it as a belated birthday present. I remember saying, back when Zelda: Twilight Princess came out, that it was the first time in ages that I’d found myself losing track of time as I played, and Arkham Asylum has been one of the few games since to have done the same thing. The other day I sat down to play, intending to do so for an hour or so, and ended up stopping four hours later. The next day, five and a half. I started at 7:00 and literally the next time I looked at the clock it was 11:30. It’s scary when it happens, but it’s also the mark of a very, very good game. A lot of this game’s inspirations are obvious, but Rocksteady has certainly picked the right ones. 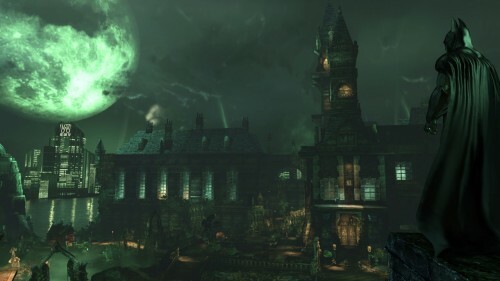 Arkham has that same worn-down and dirty – not to mention suspiciously unsanitary for a hospital – look of BioShock’s Rapture, as well as discarded audio diaries to fill in the back stories; it plays to the strengths of Unreal Engine 3 – it’s really one of the best-looking non-Epic uses of the tech, with gorgeous character models and brilliant animation – by making its buildings and architecture look like they come directly from Sera, but still differentiates itself by looking like a Batman game. Rocksteady’s carefully straddled the line between accessibility and fan service, presenting an almost-complete who’s who of Batman villains – Batman’s no killing policy and the ending leave the possibility for sequels open, of course – with hundreds of nods to famous characters and events in Batman’s past to be found, mainly through the Riddler’s challenges. I’m a bit of a Batman fan and I don’t recall anything that will cause the fanboys to lose too much sleep through the developer taking liberties, and there are a few elements that I know are drawn from the comics but drew confused rolled eyes from laymen who assumed that it was Rocksteady fabricating things. Coming at the game late on, I’d heard about the saggy portion as the game approached its climax, but I didn’t find it problematic at all. The game moves at a fantastic pace, bringing in new areas and gameplay elements constantly, doing a superb job of giving you new and interesting things to do. A list of gadgets and new moves meant that stealthy confrontations with multiple enemies was something I looked forward to, because the game does a stunning job of making you feel like Batman, using your skills to isolate an enemy and take him down silently as his friends are made ever more anxious and jumpy – look at the scene in Batman Begins when he clears a room of thugs by darting around and hiding in the rafters and imagine how badass it feels to do it yourself. And the aforementioned all-star cast of the Dark Knight’s nemeses is certainly done justice. Only a couple really strike me as feeling like your typical boss battles, and the rest are of extremely high quality. Without spoiling anything, the encounters with Scarecrow are stunningly well done, and I have high hopes that he’ll be back in the next one. I heartily recommend this game. It’s running high in my provisional GOTY list and while it’ll do well to top the one to beat, it’s definitely one of this year’s best adventures.